The competition among the states is becoming more intense as businesses become more mobile. Toyota and Boeing are two high-profile employers in America that have crossed state borders because of the policy advantages of one state over another. – The red state model is predicated on low tax rates, right-to-work laws, light regulation and pro-energy development policies. – The blue states have doubled down on policies that include high levels of government spending, high income tax rates on the rich, generous welfare benefits, forced-union requirements, super-minimum-wage laws and restrictions on oil and gas drilling. – Americans are voting with their feet to keep more of their income. 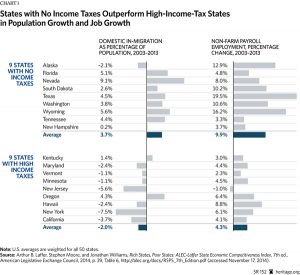 The nine zero-income-tax states gained an average of 3.7 percent of their population from domestic in-migration from 2003 to 2013, while the highest-income-tax states lost an average of 2.0 percent of their population during the same period. – The jobs growth rate was more than double in the zero-income-tax states than in the high-income-tax states, on an equally weighted basis. Of the four largest states, from 1990 to June 2014, the jobs growth rate in red states Florida (46 percent) and Texas (65 percent) has been almost triple the jobs growth of blue states California (24 percent) and New York (9 percent). – Interstate migration has resulted in the zero-income-tax states gaining more than 14 percent of their 2009/2010 adjusted gross income from the rest of the nation between the tax filing years 1992/1993 and 2009/2010. Meanwhile, the nine highest income tax states lost 8.8 percent of their 2009/2010 adjusted gross income over the same period.